The third, and final, day of The Wine Academy of Spain’s Spanish wine course was particularly intense because there was an exam looming over all of us. After 6 ½ hours of class, we had an hour to complete our Spanish Wine Educators and Andalusia Wines exam. The exam included blind tasting 8 wines and answer 5 questions about each wine (including identifying the wine), followed by 50 multiple-choice questions. It felt like Extreme Spanish Wine. Before the exam, though, we went through an introduction to Andalucía, which included a fascinating history of the region, before learning about the history of Sherry and the viticulture and vinification practices. For those who might be unfamiliar with Sherry, it is a fortified wine from Jerez, Spain. To make Sherry, winemakers start with a base wine, which is then fortified by adding pure grape spirit. 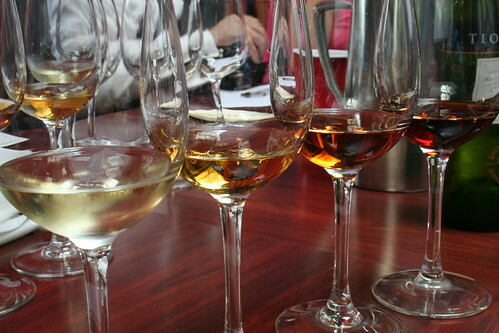 The level of fortification determines the aging process, as the lighter Fino Sherry allow for the development of a film of yeast (called flor), which protects the wine from oxidation, and the darker Oloroso Sherry are heavier, darker, oxidized wines. There is a 3-year minimum aging requirement for Sherry, and the aging system (the Solera system) that is used to blend and age Sherry is very important. 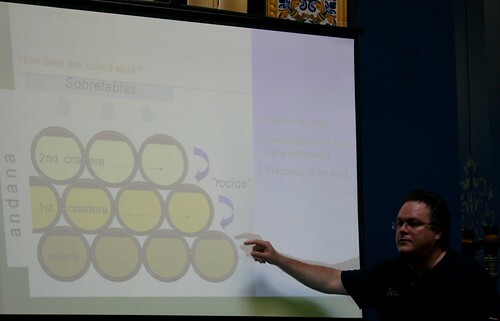 Jesus had a wonderful slide that explained exactly how the Solera system works. While the slide only had three levels of botas (the special barrels used to age the Sherry), there are generally 4 levels. 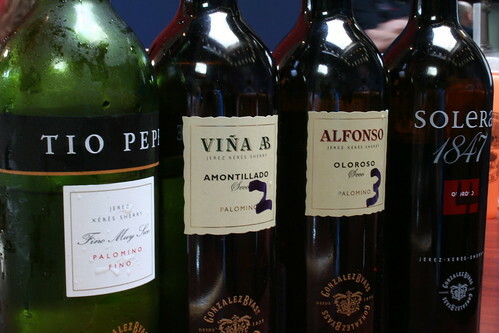 A portion of wine is taken from the bottom bota and bottled, leaving space for an equal amount of wine to be transferred from the 3rd level of botas. Once the wine is taken from level 3, there is space for wine from the 2nd level of botas to be added. After the wine from the 2nd level is transferred, the wine from the 1st level of botas replaces it. This leaves space in the 1st level of botas for the addition of new wine. What a cool experience… I had no idea that Sherry was so complex in how they make/age it. Even if most of the ones you tried weren't to your taste, I bet you still had a lot of fun trying them. TWW…the solera system is really impressive, and I loved the way Jesus explained it! Even though I'd learned about the system in my WSET class, this his explanation really just made it all click for me. Now, I guess I just have to drink more Sherry to find the styles I like.